A mind-bending sci-fi symphony, Stanley Kubrick’s landmark 1968 epic pushed the limits of narrative and special effects toward a meditation on technology and humanity. The first movement of the symphony of 2001 is titled “The Dawn of Man.” After being chased away from a water hole by a group of rival apes, a band of apes is forever changed by the arrival of a stone monolith that seems to spark them to conceive of the use of tools. The second movement takes place millions of years later, in 2001. A similar monolith has been discovered buried on the moon, and the chairman of the equivalent of NASA is sent in to control the situation. The third movement is eighteen months later, as a manned ship journeys to Jupiter, where the second monolith is sending a radio signal. This ship is controlled by a cutting-edge HAL 9000 computer, which is capable of thought but also of eluding human control. The fourth movement is a visual tour-de-force, as Dave comes closer to discovering the origin of the monoliths and is changed forever. Finally, the fifth movement puts a rapidly-aging Dave in an 18th century room in which he goes through the stages of his life. Stanley Kubrick rewrote the book on what a mainstream, major-studio motion picture could look, sound, and feel like with this groundbreaking work. 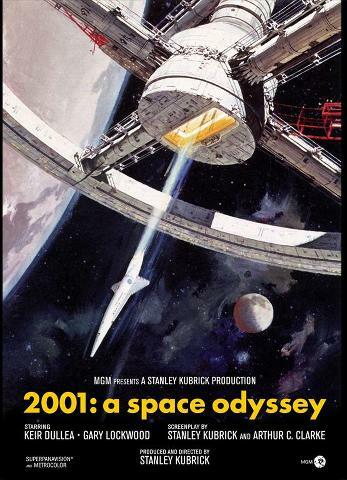 At a time when science fiction onscreen meant bug-eyed monsters menacing scantily clad women, 2001: A Space Odyssey was a visually dazzling and intellectually challenging experience. Kubrick abandoned narrative convention to tell four tangentially related stories about man’s destiny, reflected in the conquest of space. Kubrick also insisted that a story set in outer space should look like it was taking place in outer space, and his special effects team (headed by Douglas Trumbull) created some of the most stunning visual effects to appear onscreen before or since. Unlike the effects-laden films that followed in the wake of Star Wars, the imagery in 2001 doesn’t slow the story but helps move it along, and it creates a genuine sense of wonder about the beautiful, dangerous vastness of space.